ALL AUCTIONS CLOSE EVERY WEDNESDAY NIGHT 10:00 PM EASTERN TIME"
116 Coin Sleights and 236 Coin Tricks - Paperbound, 510 illustrations. When party guests request a few tricks, be prepared. Ask for a coin, and perform some of the tricks in this book. Because you will not have been aided by special stage apparatus, the results will be all the more astonishing. 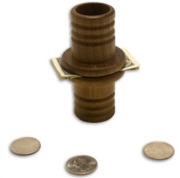 As tricks with coins are so readily improvised, they are among the most impressive forms of legerdemain. This book is the most complete treatise ever written on sleight-of-hand coin conjuring. 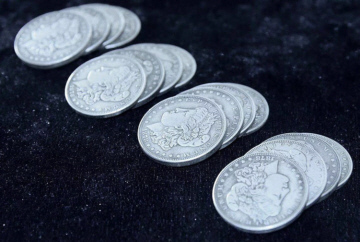 Celebrated magician J.B. Bobo has gathered here the best and most useful of all coin tricks-not only his own, but those of some four dozen notable prestidigitators, including such greats as Robert-Houdin, Professor Hoffmann and-the greatest of all coin conjurers-T. Nelson Downs. The most popular coin trick in the world. Requires no skill and can be learned in 5 minutes. 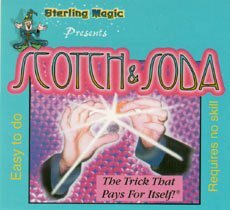 The first coin trick by everyone that ever was interested in magic. If you want to have fun, make friends this is the trick for you. The coins do all the work. Put the half dollar and the copper Mexican Centavo in your spectators hand. Have them close their hand and then it is reopened immediately the copper Mexican coin is gone and in its place is a US Quarter. The latest coin gimmick from Johnny Wong in 2010. Everyone would consider it to be a normal half dollar if they see from any possible angles. But it will soon divide into two coins once being held in the performer's hands, and then again there will be 3 coins. Just in a split of a second it is all back into 1 half dollar again, excellent. With the principle of repelling of same magnetic pole Johnny Wong has designed this product to fit in more various performing procedures. Two Beautiful coin tubes are shown to the audience. A banknote is borrowed from a spectator and is placed in-between the tubes, making it impossible for anything to pass through. Three coins are given to the spectator. They are placed into one side of the tube. One at a time, the coins pass through the borrowed bill. Everything can be handed out for inspection. Bill can be borrowed (no switching) - Coins can be borrowed (no switching) - Everything can be examined! If a magician walked up to you and made three coins appear at his fingertips. What would it look like? It would look like this. If he made those three coins fly invisibly from one hand to the other, melting into thin air and re-materializing one-by-one, what would it look like? It would look like this. If those coins then vanished, cleanly and elegantly, back into the nothingness from which they came, what would it lo ok like? You get the picture. This is Michael Afshins original version Dream Fly. A classic effect made to perfection! Coins are stacked on the back of spectators hand and covered with a leather-like cone. Coins penetrate through spectator's hand. In 1993, Akira Fujii's lecture notes were released in Japan. At that time, the Muscle Pass was transformed from an acrobatic stunt to an element of real magic. In 1996, Coins Akira's was developed as a routine that did not use gimmicked coins. In 2002, rumors spread to foreign countries and 'Jet Coin' was published in Genii Magazine. Now this routine - and others - are explained on DVD! Flash Back: Four coins concealed with cards (in a Matrix set-up) . Coins gathers in one place, and immediately return to their starting positions! Jet Coin: Three coins pass from one hand to the other. This is NOT your standard Coins Across! A shoelace or string is placed through the hole in the black Chinese coin. After a blow or two, the coin separates from the string. Coin matches the black coins in our series.